St Peter’s is fortunate in having two of the floor tiles (plus some fragments) which probably formed part of the floor before the church was visited by the Victorian restorers. 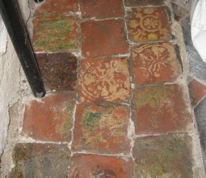 Although the tiles could have been removed before the 19th century, the Edward Hassell water colours of the interior of the church (Nos 1128, 1133 and 1144 dated 1829/30) show the floor at that time made up of flagstones plus what appear to be square tiles although there is no detail shown.. The tiles and fragments were discovered under the floor in the nave and it is fortunate that were retained rather than thrown into a skip. Most of the tiles and fragments are Penn tiles which as the name implies were made at Penn in Buckinghamshire. The period of production was between 1332 and 1390 and the tiles made before the Black Death in 1349 were slightly larger and better made than those made later. The St Peter’s tiles are post Black Death. Elizabeth Eames in her English Tilers says in respect of the period of production after the Black Death During this time most of the churches in Buckinghamshire and neighbouring counties and along the Thames Valley as far as London were paved with Penn tiles. She also states that Penn tiles were bought by Royal Clerks of Works and were used in Windsor Castle. This is interesting in view of the close connection between St Peter’s and nearby Woking Palace the latter as the manor house of the Royal Manor of Woking being in the gift of the reigning monarch. Penn tiles were probably used in other Surrey churches but there are no remaining tiles or fragments in St Peter’s sister churches at Byfleet, Horsell or Pyrford. Laurence Keen in his paper Windsor Castle and the Penn tile industry (Windsor: Medieval Archaeology, Art and Architecture of the Thames Valley. Maney Publishing. 2002) only mentions Chertsey Abbey, Guildford 59 Quarry Street, Kennington Palace, Lagham Manor South Godstone, Merton Abbey, Oatlands Palace and Sheen Palace Richmond as Surrey sites with Penn tiles so St Peter’s, Od Woking must be added to that list. Probably Eames (1980, Catalogue of Medieval Tiles, British Museum Publications) design type 2342 (Hohler type P68) or possibly Eames design 2337. There is a white border on 2337 (missed from Eames’ published drawing) – so both designs are very similar. In fact they could be the same design!. The white border is not visible but is often missing where the stamp has not been pushed well enough into the clay before firing. The edges are also frequently removed when the tile is trimmed after the application of white slip. So the lack on any visible white border does not mean it is not either design 2342 or 2337. Eames design 2353, 2354 or 2355 or something similar. Tile 10 = This has the same design as one of the Woking Palace blue and white Valencian tiles. This tile was probably acquired by the church after the Palace was abandoned in the 1620s. There is also a tile on the outside of the tower on the left hand side by the church entrance which may well have been a Penn tile. This tile which is weather worn with most of the detail worn away is embedded in the stonework presumably helping replace a building stone which has fallen away. A further Penn tile measuring 107mm x 110mm at its extremes and 25mm thick was discovered in 1983 in the fields between the church and the Woking Palace site. This tile is most likely to have come from St Peter’s. It is now in the care of The Lightbox. A fragment of a Penn tile has recently been discovered in the filling to the tower at St Mary’s, West Horsley. This is a Penn tile of 1350-1390, Eames design type 2339 and St Mary’s must be added to the list of Surrey churches with Penn tiles. When the above tiles were discovered a number of other less well preserved specimens were found. These were not considered worthy of special preservation and one of the parish architects recommended that they be laid in their present position in the porch behind the Great Oak Door. It was thought that they would be accessible to viewing there and at the same time protected from excessive wear.